JBT Corporation has announced the launch of a new system for cold-extracted fruit and vegetable juices, which they said is designed to overcome complications with traditional bag presses. Capable of processing a variety of fruits and vegetables, the READYGo FVP™ offers juice extraction at up to five tons per hour of raw product, according to JBT. 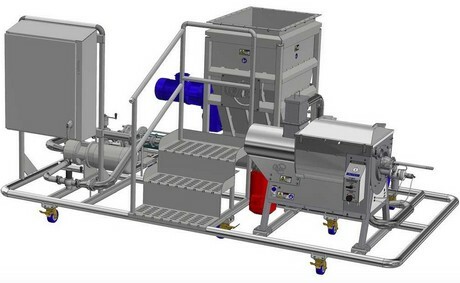 The result of two years’ research involving prototypes and precursors, the FVP (Fruit and Vegetable Processing) skid incorporates JBT’s chopper pump, the FVX-5, with an external FVG flow-through grinder and a UCF110 screw finisher. The company notes that no heat is applied during extraction, making the juice or blends suitable for immediate bottling followed by HPP processing with JBT’s Avure high-pressure processing systems. JBT says that unlike a traditional bag press – an accordion-like structure, which squeezes the pulped produce through a nylon cloth – the FVP does not require emptying and refilling after each batch. Instead, the FVP offers continuous processing, which is hygienic and easy-to-clean, while at the same time being completely enclosed. The company states: "Easily automated, the FVP can also handle up to five tons per hour, and delivers a yield of anywhere between 50 percent to 92 percent across a range of commonly processed fruits and vegetables. Depending on the product it can generate up to 20 gallons per minute of fresh juice." The first completed FVP is expected to be ready for commercialization in January 2019.